Tactical simulator for submarine training. Tailored solutions. SAES has participated in the development of two tactical submarine simulators for the Spanish Navy. Based on our experience in acoustics and simulation, we offer our customers solutions adapted to the requirements for every situation. SAES simulators for submarine training have been designed to faithfully reproduce the scenarios, equipment, aspects, operation and sensations that the submarine’s equipment would have in a real situation. Experience in tactical simulators for submarine training. For the S-70 submarines, SAES has developed the tactical simulator, called SATS. 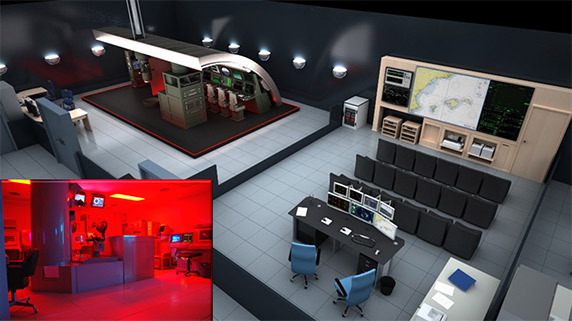 This simulator integrates all the elements and systems of the control room as well as the instructor’s station. The SATS tactical simulator is still active today as the main training tool. In a more recent project, SAES participated, together with Navantia and Indra, in the simulator of the new S-80 submarines, called SIMTAC-S80. The SIMTAC S-80 Tactical Simulator reproduces the crunch and starboard zone of the Spanish S-80 Command and Control Chamber. It also has two instructor stations and an analysis room. Sonar stimulators and sonar simulators of Cylindrical Sonar (CAS), Flank Array Sonar (FAS), Towed Array Sonar (TAS), Acoustic Interceptor (IA), Passive Ranging sonar (PRS) and Mine and Obstacle Avoidance Sonar (MODS). Simulator of Towed Array Handling system (TAHS). Acoustic integration of torpedo simulator. Simulator of Acoustic Countermeasure System.